After dinner we had a little bit of free time so I wrote in my journal, wanting to go along with the do-not-speak suggestion for some quiet contemplation. Unfortunately for me, others saw it as a moment to finally break silence and talk about everything that had just happened at dinner. Oh well. 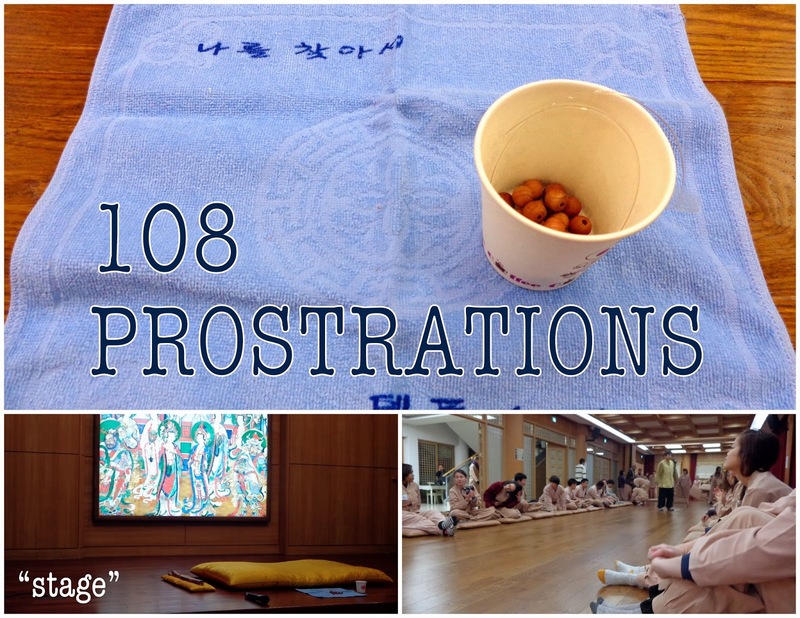 We met back in the main temple stay room at 7:30 for "108 prostrations". We set up the mats in two rows, facing each other. We were each given a small cloth/towel to lay out on the floor just in front of our mat, and a dixie up with wooden beads and a plastic string. The monk came in and sat at the front of the room on the yellow mat, pictured above. She had us dump out the cup's contents on our towel and count the beads. There were 27. We were going to do a sequence in which after every four full bows, we would string on a bead. (Remember a full bow consists of standing with palms together, kneeling down, lowering forehead to mat, turning palms up facing the ceiling and raising hands to ears, then turning hands and bringing them back down to the mat, lifting your forehead up back into kneeling position, palms together, and stand up.) This was a smooth, continuous motion because we'd string on the bead after bowing with our forehead on the ground the fourth time, and then stand up. We would repeat until all beads were on the string. 27 x 4 = 108 prostrations. 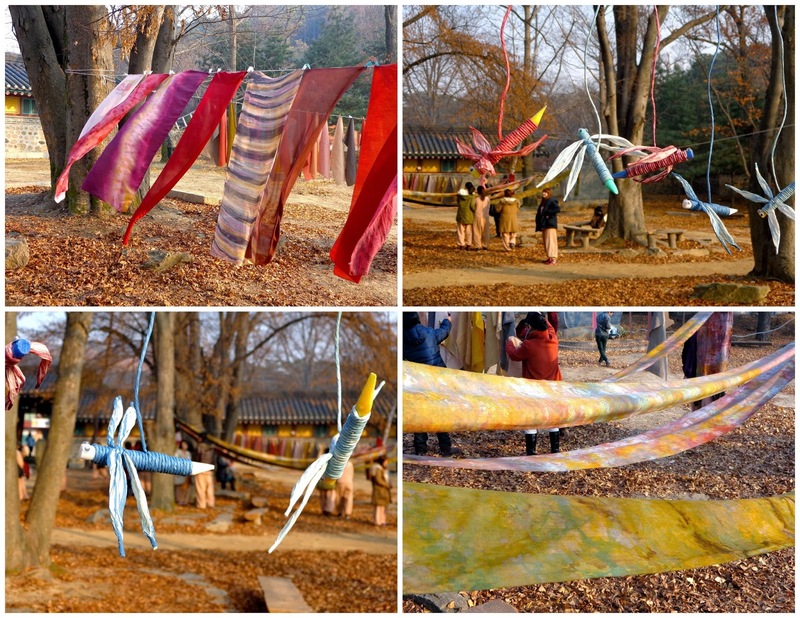 The monk told us that for each bead, we were to think of a desire/wish we had, and focus on that desire during the bows. I thought it would take a long time to do all of the bows (In hindsight it probably did), but each bead seemed to go by so quickly. It was sometimes not enough time for me to think of my next desire/wish to focus on. But had I been thinking about the number 108 rather than knowing I only had 4 bows to think of and focus on a worthy desire, it probably wouldn't have felt so fast. During the 108 prostrations there were photographers and camera men taking pictures and filming. 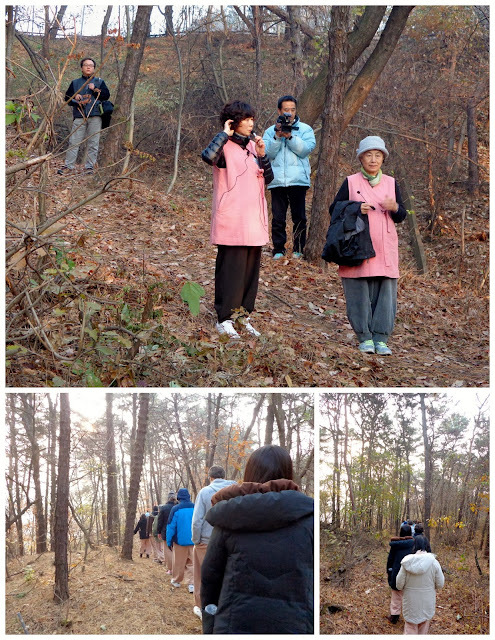 They were part of the Korean Culture and Information Service organization, but no one ever told us we'd be constantly filmed and photographed throughout the weekend trip. It often interrupted the temple stay experience, just as it's now interrupting my story. It was rewarding to finish the prostrations and see our string of beads complete after the meditative bowing activity. The monk had us hold it up to our wrist and see how it fit. The twenty-seven beads were definitely too big for my little wrist. She told us to just take off any extra beads until it fit our wrist perfectly, and then tie the ends together. After spending the time and energy to "earn" each bead through the 108 prostrations, I almost didn't want to take off the extra beads. This was a shared feeling that the monk brought to our attention, since the act could teach us a lesson. In life there are many things, represented by the 27 beads. These things could be clothes, movies, jewelry, food, gifts -- basically any possessions. We don't need all of them, only what fits our "wrist". The rest is extra baggage that gets in the way and causes problems. So we should be careful and pay attention to the size of our "wrist," and what we actually need. Since I've been reading about and practicing some minimalism these last few years, I really liked the message of the beads. I especially enjoyed the lesson because I wasn't expecting it; after completing the 108 prostrations I never thought I'd end up with a bracelet that had anything less than 27 beads. It wasn't the best night of sleep I've had, and that night certainly got cut short by our 3:00 a.m. wake-up call. They played calm music on the speakers to wake us up, which was so much nicer than an alarm or lights on. 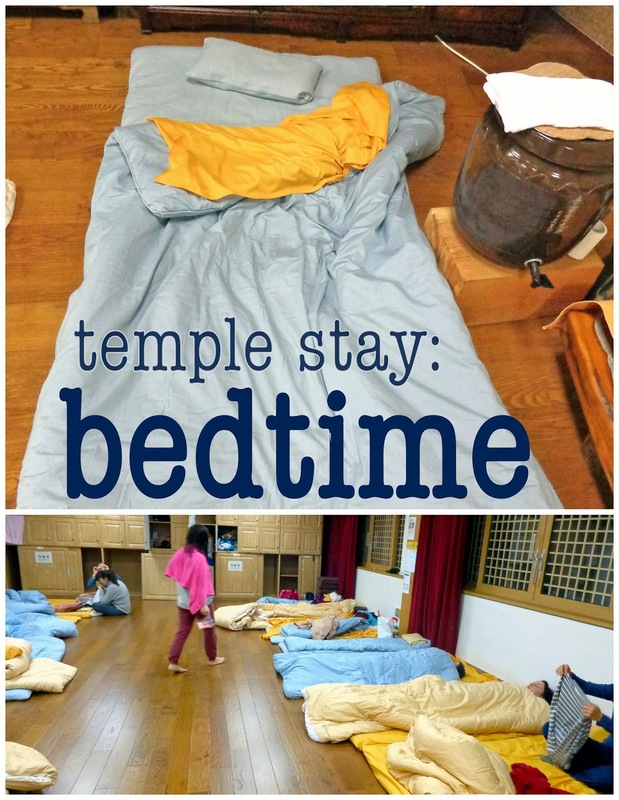 But it was still 3 a.m. We brushed teeth, put on our monk garbs and coats, then put on shoes downstairs to walk over to the temple. Well, most of us. Some stayed in bed. Every time we walked to/from the temple during the stay, we would first line up in rows of 3 or 4 and stay together as we walked. We were not in the same temple as the other monks that morning (I doubt there would have been space for all of us, and I don't doubt that we would have been a big distraction). Rather, we were in a temple space directly behind it. They opened the wooden wall panels of our space (I'm not sure if I should call them doors or windows) at the front of the room so that basically the whole front "wall" was now open, cool, dark, outside air. You could see the temple ahead of us in the distance, and we could hear the temple bells and chants. Our lady monk came in and knelt at the front, facing the temple. We followed her lead and did bows with the monks in the temple. This time I was wearing my winter coat, so it was impossible to touch my forehead to the mat when bowing. I was super tired and didn't care -- and no one bothered me about it, thankfully. Then we did two chants (while bowing) with the monks; we had sheets with the Korean words romanized. And before I knew it we were heading to the door, putting our shoes back on again to walk back to the temple stay building. Somewhere near the pagoda the monk had us stop and line up nicely, then listen to her talk. I don't remember much of what she said, and I'm not sure if that's because of the hour, the interpreter, or because I didn't write any of it down and it was two weeks ago. I do remember that for the walk back to the temple stay building, the monk told us to be absolutely silent. She said be careful not to make any noise whatsoever with your footsteps, your coats, nothing. We walked very, very slowly. It was sort of meditative, and I rather liked trying to be silent in my fuzzy, half-awake state. But I was also highly irritated by any sound that I did hear. Are these people even trying to be silent? my un-slept self wondered every time I'd hear a shoe scrape against the stone path. I think I was supposed to feel a lot more at ease and not get so angry at these other people, but when I'm low on sleep that's not my natural state. 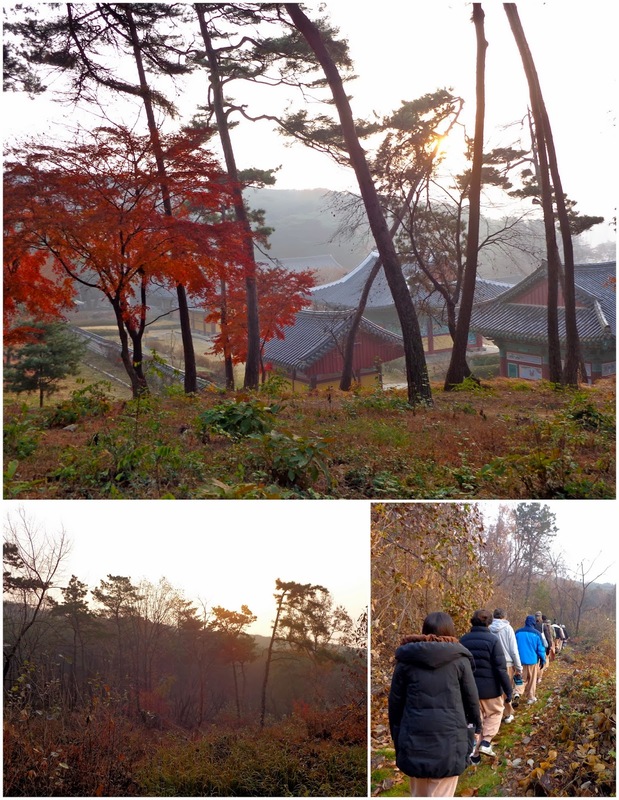 It took a decent amount of time to walk back to the temple stay building that morning, rather than the usual 5 minute walk. When we got back, we went into the main room for meditation. First we did a seated meditation. We had the thicker mats and folded them in half before sitting down. Rather than the regular cross-legged position, we pulled our feet up and over the other leg into lotus position. Our hands made an "O" shape in the middle of our bellies. The lotus position is better for your spine, as it makes you sit up straighter. However, my body was not having it. We were doing silent meditation, and I could quickly feel my right leg falling completely asleep. Not the tingly asleep, but the dead-weight asleep. And then it got super uncomfortable super fast. I knew my position and clothing had somehow cut off blood supply in my legs. Had it just been us 50 and the monk, I would have tried to quietly move around and straighten my leg a little, as everyone's eyes were closed. However, the temple volunteers were walking around, adjusting people's posture as we meditated. The camera men were also walking around, taking pictures [insert camera shutter sound here] and filming. How much longer, how much longer is all I could think. I was not able to meditate at all because I could only think of my leg and how badly I needed to move it. It was not a pleasant feeling at all. I started to sweat, so anxious to move. How long would we be in this position? How long had it been? More than 5 minutes. Had we hit 10? I must have been visibly uncomfortable, because then a temple volunteer came up behind me and whispered that I didn't have to keep my hands exactly where we'd been told, that I could relax my arms and be comfortable. It didn't resolve the leg problem, but I let my dead-weight right leg slide forward a little bit anyways. Off the mat, I could feel it sliding a little ways forward on the wood floor in front of me, but I couldn't control it because it was still 100% asleep. My eyes stayed closed. Maybe a minute after, the monk talked again and now instructed us to lie on our backs with legs straight out. Thank goodness! I'm not sure how long the sitting meditation had been (maybe 10 minutes? ), but it was the most unpleasant my body had felt in a while. Making my legs straight was such a relief. Slowly the feeling came back, and I could finally relax. We breathed deeply on our backs. There may have been calm music playing in the background, I don't remember. Then the lights began to fade. The monk stopped talking and the lights went off. Perfect. Lovely. I can relax and be calm. And quietly laugh at the camera men who probably aren't sure what to do right now, hehe. Not even a minute later I hear someone snoring loudly. No joke. At some point I nod off, as well, but not that quickly. Keep in mind it's completely dark, the monk is silent, we're lying on our backs, oh - and we had woken up at 3 that morning. Again, I'm not sure how long this "meditation" lasted, but I think it was for quite some time. But then the monk broke the silence and woke us up. Before the lights came back on, she had us turn on each side and do some stretching. Then we had to sit up. She asked how the meditation was, knowing very well that most all had fallen asleep, and then made some joke about the snorers. After the meditation (and nap), we put on shoes and coats to walk back over to the temple. We went to the same building as where we had had dinner the night before, but this time we headed to the basement cafeteria. We waited in a line and served ourselves. There was rice, kimchi, lots of other side dishes and vegetables, and soup. I can't eat a lot for breakfast, so I took some rice, a tiny bit of kimchi (for you, stomach! ), a few potato pieces and soup. 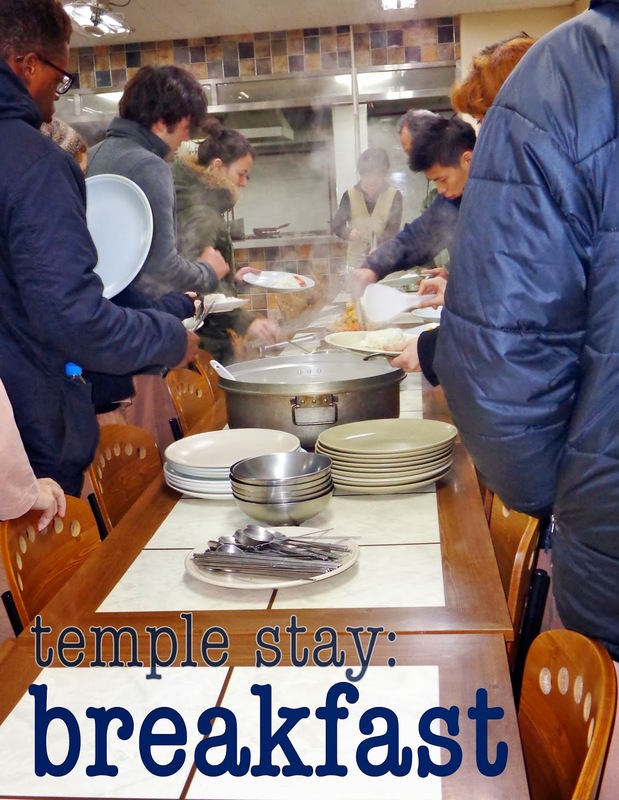 After eating, we could take our dishes to the adjacent room for washing, then walk back to the temple stay building. At this point we had free time until 7:30 a.m. (amazing!). I had put my bed stuff away earlier that morning, but I pulled another mat out of the cabinets to nap on the floor. Many others used the time to sleep, as well. The next activity was forest walking meditation. We left the temple stay building, crossed the street, and walked over to the temple grounds. Behind it were paths through a forest that the monks usually walk through. Later on in the walk we stopped to each hug a tree and listen to it. I really liked that, and then we sat down and had a 10 minute meditation. I liked that too, because the two talkers had to actually stop talking. (Once we started walking again they resumed right back up). I've been thinking I might like to do some other sort of temple stay or meditation retreat on my own in the future. I would get more out of it if everyone followed the rules and respected the silence. Then we walked back to the temple stay building for the morning's final event: a tea ceremony. The main room was set up with small trays with a cup and plate of Korean rice cakes. 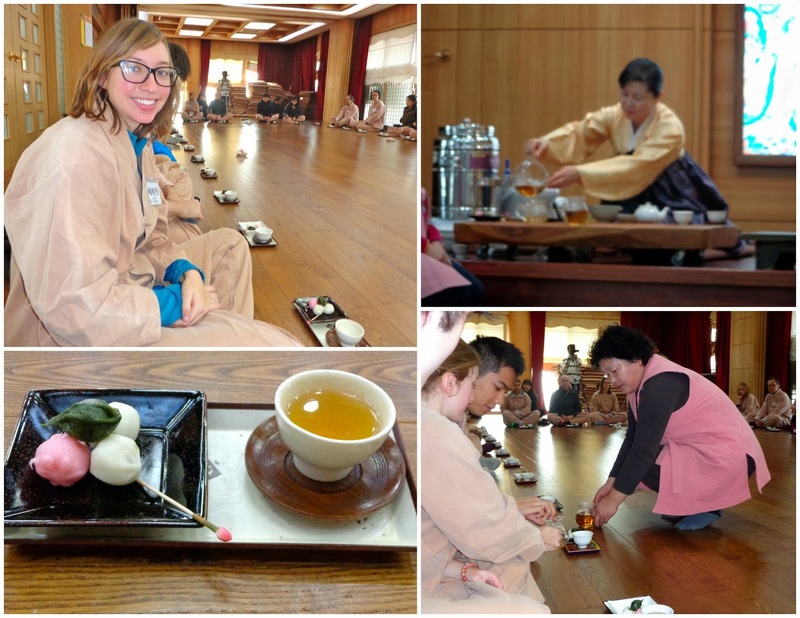 A woman up front taught us about tea ceremonies (where to keep your hands during, how to properly drink the tea, etc. ), and prepared the tea for everyone. She would pour it into smaller glass pitchers that got passed around the room so we could fill our cups. The tea had to be drank in three swallows. You put the cup on your left hand, which is flat, palm up, and parallel to the ground. Your right hand completely covers the front of the tea cup as you lift it to your mouth to drink. We weren't supposed to swallow until the cup was back down, away from our mouths. The rice cakes were so delicious. Then the head monk came in so we could have "conversation with a monk" and ask him anything. Like most, I was unaware this event would be happening, so I didn't have any questions in mind. A few people did think of things to ask, and it took quite some time to get answers with all of the interpreting that needed to happen. The monk never seemed to answer a question directly; he enjoyed rambling about random buddhist beliefs and so forth. Maybe it would have felt different if there wasn't a language barrier and so much translating going on, I'm not sure. I think it was 11:00 when the final ceremony officially ended. We were given evaluations to fill out (from the temple stay people), and our cell phones were returned. Then it was upstairs to change and pack up.